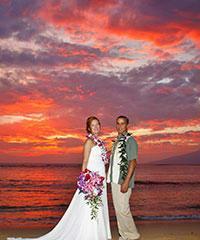 The wedding industry on Maui is 'through the roof', in terms of the number of people choosing to get married here. And why shouldn't it be? Maui has incomparable beauty and plenty of white sand beaches which seem to the the location of choice for 'couples to be' to have as they'er wedding venue. We are fortunate enough to be able to work with quite a number of individual wedding planners and we have provided the listing of names of these services below for you to contact on your own. Arranging for a full wedding is somewhat above our 'pay grade' here so it is best if we simply put you into direct contact with the individual wedding companies who are prepared to deal with all the complexities. 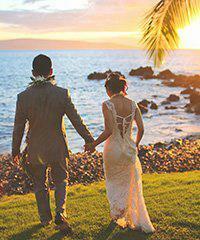 JoJo Maltese can be your Maui Wedding Planner and Maui Wedding Photographer. In Hawaii since 1986 working in the Wedding Industry this wedding consultant, photographer and videographer offers refined services with a Romantic, Playful and Creative touch. Maui'd Forever is a leader in providing wedding services known for offering clear easy to understand, well priced wedding or vow renewal packages. 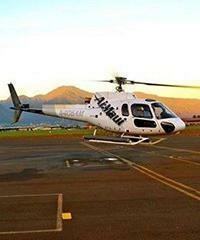 Maui'd Forever will help you make your Dream Hawaii Wedding a reality. Whether you are looking for a casual beach, a romantic waterfall or at a resort setting, big or small, they offer everything you need: a minister, photographer, flowers, licensing help and more. 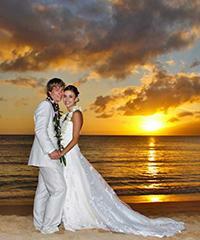 Wedding and Vow Renewal packages are available on all islands, Kauai, Maui, Oahu and the Big Island of Hawaii. Pulling off the perfect wedding, at the perfect location with all the perfect amenities is, as you're probably aware, a time consuming and detail specific endeavor and somewhat out of our sphere of expertise. Having a wedding in an exotic far away location is a dream of many. Planning a wedding in an exotic far away location is a different story. Keep your wedding fun and let us help you make everything just how you want it so you don't have to spend this special time feeling stressed. Our wedding coordinators work with the best photographers, videographers, florists, musicians and purveyors to assist in planning just want you want. These packages can be easy, simple and affordable.